Last weekend I took a little vacation to Kansai. It must be at least the tenth time I’ve gone, so I’ve gotten pretty used to Kansai-ben at this point. That said, the first time I went there I pretty much knew nothing of it aside from the one day we spent on it in college, so a lot of stuff was hard to understand. On top of that, there’s a lot of other dialects of Japanese as well. We’re going to take a little look at the idea of dialects this time around! Dialogs can vary based on a lot of different factors, but the most common is of course location. 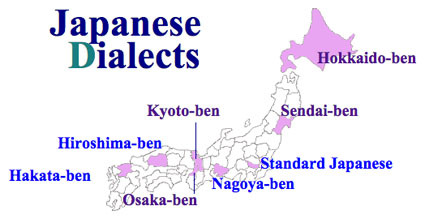 Looking at names for Japanese dialects, pretty much all of them indicate where they originate - “Kansai-ben”, “Sendai-ben”, etc. There are many different dialects of English as well, but for the most part we tend to instead think of them as “accents”. In Japanese, different dialects have different word use and conjugation, but pronunciation itself doesn’t seem to vary quite as much from what I’ve noticed. On the other hand, even though we think of them as accents, there are a lot of vocabulary differences in English dialects as well. We have the most common greeting, “hello”, which equates pretty directly to “こんにちは” (konnichiwa), but also words like “howdy”, which could be comparable to Kansai-ben’s “まいど” (maido). This extends outside of the US as well - “‘ello” in the UK, “g’day” in Australia, etc, are clearly from non-American dialects. Listening to the words people use, you can get a good idea of what country they might be from! Even unrelated to location, dialects can arise from cultural influences. Probably the most well-known example of this in America is what’s commonly called ebonics. In Japanese it’s referred to as “黒人英語” (kurojin eigo), literally “black person english”. Obviously ebonics isn’t used by all black people, or only by black people, but its use is mainly concentrated in that subclass. Just as in other dialects, there are differences in words, conjugation, and pronunciation. And just as with other dialects, you can get an idea of what culture a person comes from based on the cultural dialect they may use. Culture-influenced dialects aren’t unique to the US, either. Subcultures like chavs in Great Britain and bogans in Australia also have their own unique words and ways of speaking. I don’t know if there’s necessarily an equivalent in Japan, but it seems as though motorcycle hoodlums or perhaps Yakuza may have their own dialects as well. It’s not exactly a dialect, but Japan’s “敬語” (keg, honorific language), is another special form of speaking with unique words and phrases that aren’t used otherwise. We don’t exactly have a strict respectful language rule set in English, obviously there is the idea of politeness, but it is much less structured. We have ways to make certain phrases more polite, as above, but we don’t have things like set polite forms of verbs as in Japanese. The idea of adding a prefix to a noun to make it polite also isn’t really a thing. Even thinking about the examples of polite speech that do exist in English, many sound very old fashioned. On top of that, the situational use of polite language is different between Japan and America as well. If you’re talking to a superior at work, or a police officer, you’ll go out of your way to be polite, but food servers and cashiers aren’t strictly expected to use super-polite language with customers. In high school and college as well, it often happens that teachers will tell students that they don’t have to worry about being overly respectful. Japan also has the “内外” (uchi-soto) concept, essentially the idea of other people being either in your “in-group” or “out-group”, which is also something we don’t pay as much attention to in the states. You might already be familiar, but this is Leopaldon’s NO DISCO CITY. The original song it samples, “俺ら東京さ行ぐだ” (ora tokyo sa igu da) has lyrics written to meld a variety of Japanese dialects to give a countryside feel. If you want to learn a language, don’t just study grammar and vocabulary - take a look at dialects and linguistics as well!